The working copy of my 2013 Travel Wish List looks very much like the ones from 25 years ago that I secreted away in my desk drawer like an un-mailed letter to Santa Claus. 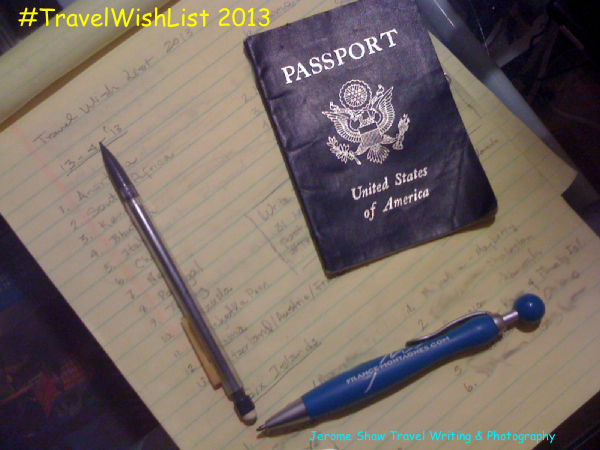 The main difference being I am sharing the 2013 #TravelWishList with the world. Why create a #TravelWishList? One of my main reasons: it is fun. The best part of travel is in its anticipation. The longer I live the more accurate this adage becomes. As a travel journalist my relationship with travel is enigmatic. I have come to dislike the act of transportation but I love to discover new places. I love being there. I dislike getting there. The cost of travel, the annoyance of air travel, the continued homogenization of the world, all serve to make actual travel more and more unpalatable. While virtual travel and more precisely, dreaming of new sights to see and places to be, is perhaps even better than it was 50 years ago. Certainly with all the travel bloggers canvassing the far reaches of every continent we are not lacking for information about the places we dream of being. My reason for publishing my once "secret" travel wish list is more mystical. You can read about that in part one where I share background on my travel wish lists' from years past and list the candidates from which I selected my 13-4-'13. Now it is time to reveal the thirteen places I'd like to explore, photograph, experience and write about in the next year. This continent will likely remain on my travel wish list until I get there or finally despair of ever setting foot on the ice of Antarctica. Suffice to say it is a travel photographer's dream destination and on the list of most travel writers as well. Antarctica holds the number one spot on my list and remains the key to completing the Big Seven. Maybe by the time I reach the southern polar cap I will have learned how to spell Antarctica right on my first attempt without the aid of spellcheck. Africa is another perennial travel list designate. But South Africa is a first timer. SA has risen in my esteem greatly over the last couple of years both for the variety of the topography and the great adventures that are available at the southern tip of the dark continent. I have always enjoyed the South African people I have met, both in the United Sates and while living in New Zealand. They make good transplants and excellent ambassadors for their native country. It is just time. It is time to see the animals before any more time passes. Bhutan is on most every travel writer's wish list ever created. Bhutan was a staple of my wish lists early on but I eventual dropped it in favor of more attainable goals. A few years ago while reading The Geography of Bliss by Eric Weiner Bhutan leaped back into my consciousness. In the last few years I have had great conversations with travel people from this isolated kingdom that have revived my hope of one day seeing this very unique corner of the earth. Italy is country that I put on my wish list every so often. It is hard to believe I have not been there yet. Sometimes I even think I have been to Italy because I read so much about Italy. Everyone tells me how wonderful it is while exhorting me with a dismissive, disbelieving jab "you haven't been to Italy! You simply must go." So Italy this is your chance - help me live down my shame and allow me to eat laugh and love on your Mediterranean soil. They may pull my travel journalist ticket if I don't eat a meal on Italian soil soon. A new country on my TWL this year is Chile. When I have thought of going to Chile, I have wanted to go to ski. Lately though I have noticed myself interested in visiting this slice of South America for other reasons, like wine, wilderness and adventure. Chile has supplanted Argentina as my top wish list choice in South America. It has been a dream of mine to trek in Nepal since well before I filled out my first Travel Wish List over twenty years ago. I used to read accounts of climbers braving the elements and altitude to reach the highest places on the planet. I never fancied myself to be such an adventurer, even in my youth, but still the desire to reach above my present altitude record of 15K propels me to vista Nepal. That and a culture I greatly admire and some of the most breath taking scenery in the world. Another new TWL country is Portugal. To some degree Portugal like Chile has supplanted a neighbor on my list. Portugal replaced its Iberian neighbor, Spain in my top 13. The wine, the women, the food, the value and the fact that not many other people are talking about Portugal have piqued my interest. I don't have precise or articulate reasons for putting Turkey in the top 13 - I just did. A photo student of mine showed me their images from a trip to Turkey and since then I have wanted go make my own portfolio of Turkey. The third new member of my TWL is Venezuela. I want to see it before it changes too much. And, I think it may be on the cusp of change. Venezuela and Cuba have more in common other than capricious leaders. Along with Nepal my desire to see this far eastern landscape predates my creating travel wish lists. I read tales of hiking and climbing in the Kamchatka back in my days in Aspen, Colorado before I had ever left the boundaries of the Untied States. The Kamchatka is one of the many place in the world that I almost visited but in a stroke of misfortune my assignment to the Kamchatka was canceled. Woulda, coulda, shoulda. The only part of Central America I have had the privilege to visit is Costa Rica. I need to get a broader perspective on the bridge between North & South America before I make any decisions about this region as a travel destination. Panama would provide that. 13. And finally, Switzerland is my last designate for my #TravelWishList. Why Switzerland? It is tough to chose that final spot. Many places were flitting in and out of my head. The space next to #13 on my legal pad notes is quite scuffed from erasures. But, Switzerland it is. Switzerland is my choice for the skiing, the chocolate, the precision, the mountains, the cities, the lakes … did I miss anything? Part and parcel in choosing Switzerland are Austria and France. Because when I go skiing I plan to zigzag around the Alps to compare the three locales. So there you have my thirteen choice for places I hope to visit in the next year. There were lots of tough choice and some great places that dropped off my list from past years and some new blood too. Now comes the hard part, making these wishes come true. Did I hit any of your favorites? Did I ignore some places that are on your personal TWL? December will roll around all too soon and it will be time to pull the wish list out of my desk drawer and see how many spots I hit and missed. Then it will be time to do it all over. The good news is I get one more slot next year, 14-4-'14. I'll be posting the other sections of my TravelWishList over the next few days with breakouts for the 6 islands I want to explore and the 6 places in the United States I hear calling me. I confined my travel wish lists to places I had yet to visit so I'll single out the 6 places I have already visited that I want to return to in another post. The cherry on top of the wish list pie is I'll share some of my favorite places in Colorado and the neighboring states. 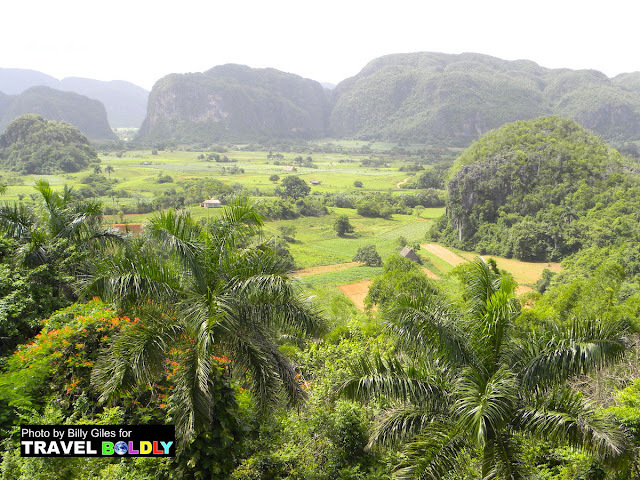 I hope you'll share your #TravelWishList with me here in the comments.